Vegetable seed catalogs tempt us with descriptions of taste, beauty, productivity, and occasionally an intriguing story or bit of seed history. It was a story that drew me to Gilfeather turnips a decade ago, and I’m glad it did. I’ve continued grow this truly delicious root in each winter’s kitchen garden and as an added treat I’ve watched its story grow too. Over the years, the catalog descriptions kept up with the Gilfeather story adding the information that it is now listed in the Slow Food Ark of Taste and leading off for the last several years with the reminder that: “At the end of October each year, Wardsboro hosts a festival at which all the dishes served feature its famous vegetable.” I haven’t been to this event but several years ago when I was in Vermont in early October I spotted a poster for the Gilfeather Turnip Festival. Then recently I found a 23-minute documentary: The Gilfeather Turnip: Rooted in Wardsboro. It’s definitely worth watching, even if you don’t like turnips. 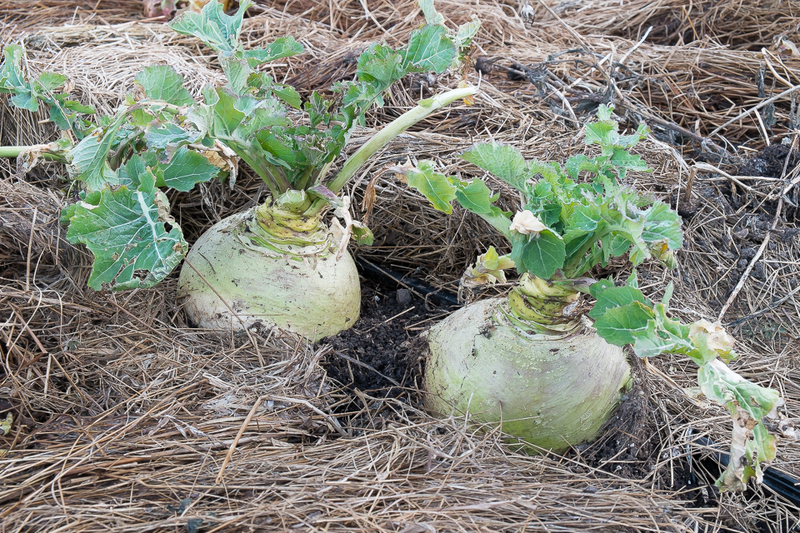 There’s also a great recent newspaper article: “Turnip festival sprouts again at end of month.” If the film and article tempt you to plant Gilfeather turnips, Fedco carries the seed and this year I noticed that Wild Garden Seeds in Oregon offers them too: . Vermonters eat the Gilfeather roots peeled, boiled and then mashed and while Gilfeathers are good that way I prefer cutting the peeled roots into chunks, brushing them with a little olive oil and roasting them at about 400 degrees so the sugars caramelize as the roots soften. 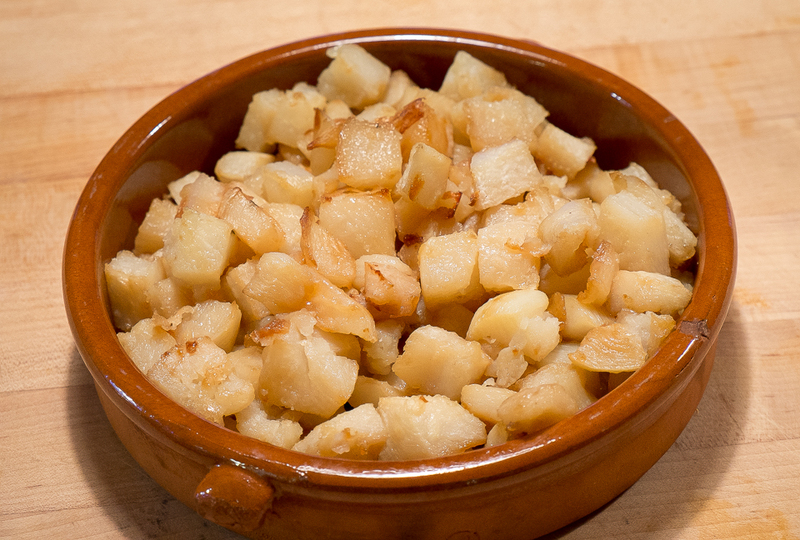 Boiled or roasted, the flavor is like a more delicate, sweeter rutabaga. 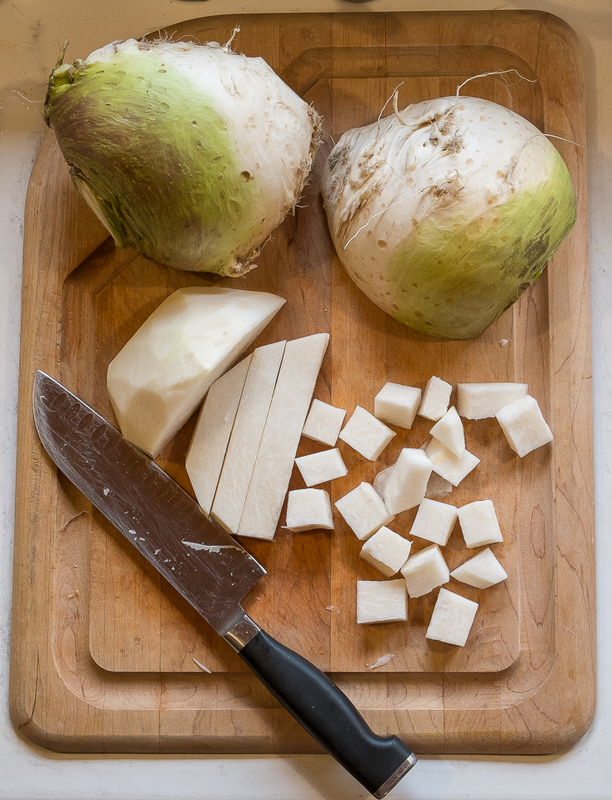 The pungent, earthy rutabaga taste lingers but there is also a hint of sweet spring turnips. I serve them warm as a side dish, alone or mixed with other roasted roots, or add room-temperature pieces to winter salads of kale, mustard or mache. I’ve also pureed them into soups, using vegetable or meat stock and perhaps a little cream. I can’t imagine winter without them. I’m grateful to John Gilfeather for this delicious winter root and to the people who’ve kept the seed and the story alive. I might have been tempted to grow Gilfeathers by descriptions of taste and hardiness alone but the story has been a delightful bonus and something to remember as I plant, harvest and cook this Vermont heirloom turnip. Winter radishes have been a surprise treat in this season’s kitchen garden, just the colorful boost these darker months need. Back in April, in her weekly Washington Post gardening column, Barbara Damrosch wrote about these large storage radishes, specifically her favorite Beauty Heart, and advised waiting until late summer to plant them. I took her advice and I’m glad I did. On August 23rd I planted a ten-foot row of a winter storage variety called Red Meat, similar to Beauty Heart but not so appealingly named, thinned seedlings to four inches apart a few weeks later, and we’ve been enjoying them since November. 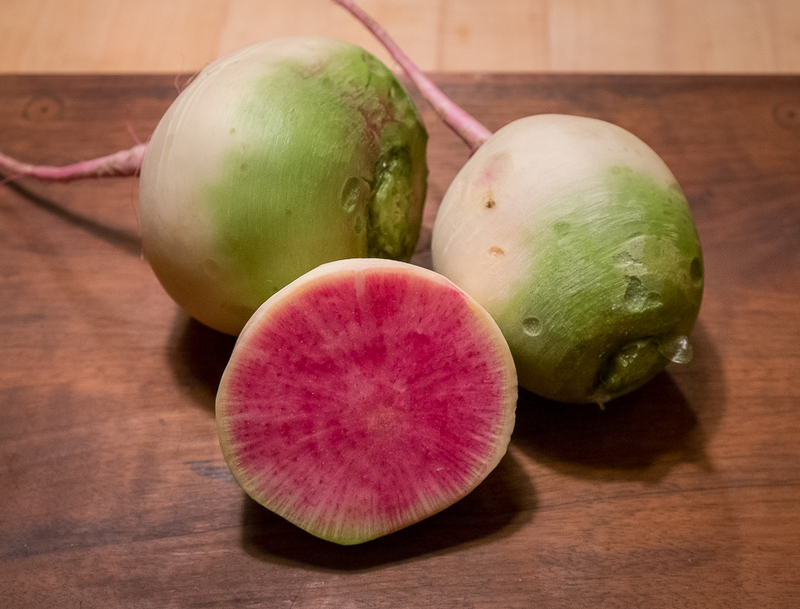 Familiar, quick-growing spring radishes are typically red on the outside, white on the inside and smaller than a golf ball while slower-growing winter storage radishes like Red Meat and Beauty Heart are white to light green on the outside, dark pink/red on the inside and often as big or bigger than a tennis ball. Their unexpectedly gorgeous red centers explain their other common name: watermelon radish. Like spring radishes, winter storage radishes are deliciously crisp but Red Meat is milder than a spicy spring radish, tasting almost sweet. Winter storage radishes also hold much longer in the kitchen garden than spring radishes do. 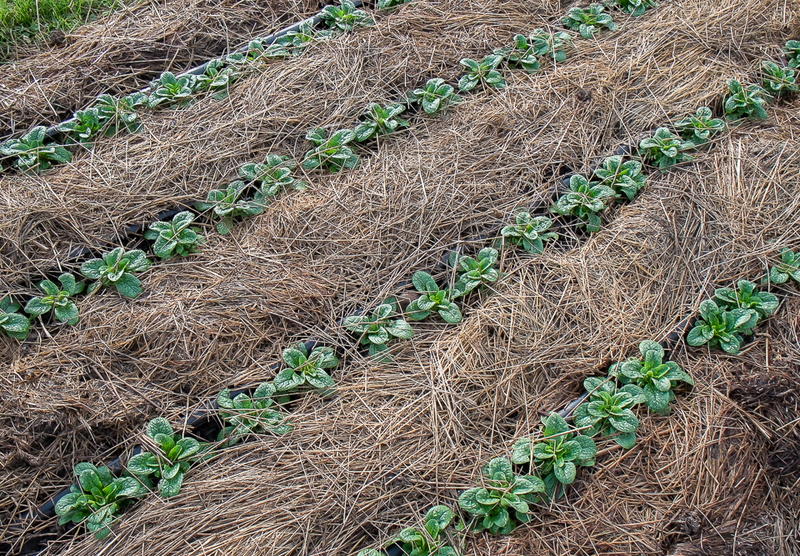 Mulched, they survived December temperatures in the low teens and those remaining in the row are still fine. I’ve also kept some in the refrigerator for a few weeks at a time and they’ve stayed firm and tasty as well. The Kitazawa Seed Company describes one of their watermelon radish varieties as “the most popular variety grown in the middle and northern parts of China,” adding that “because of their color, they are the perfect radishes to carve into flower shapes as garnish.” I haven’t done any radish carving but we’ve certainly enjoyed the dramatic color and crisp, mild spiciness of these winter radishes in salads. And I’ve been experimenting with other ways to eat them. A few weeks ago, I cut a several into chunks and roasted them along with some other winter roots. Their color faded a bit but they added a lovely mild turnip flavor to the mix of stronger-flavored roots. 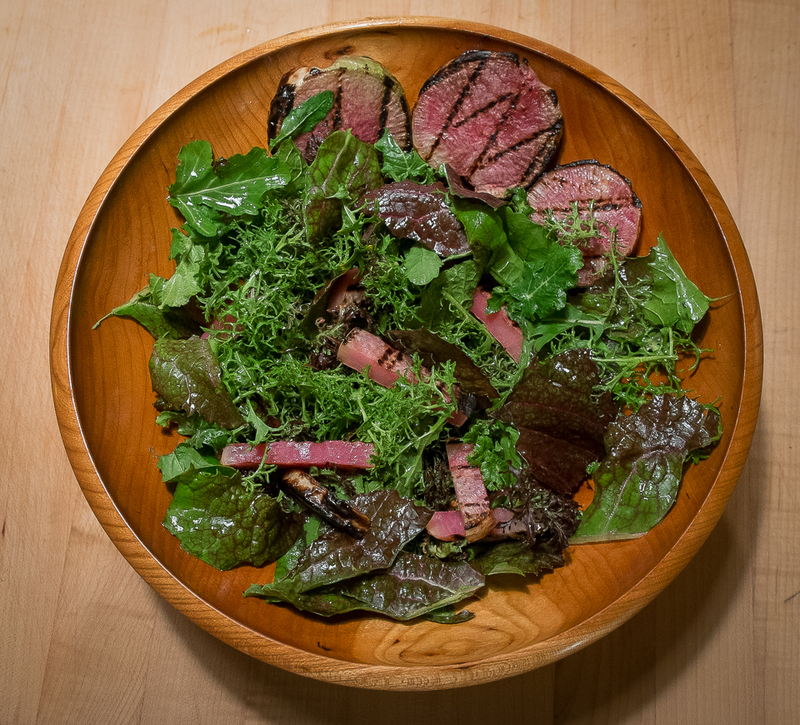 The other night, inspired by a recipe for grilled spring radishes, I sliced a large Red Meat radish into quarter-inch rounds and Scott grilled them along with some pork chops. The slightly charred edges and smoky radish flavor were wonderful. This technique is definitely one to try again, perhaps with the rosemary brown butter dipping sauce from this recipe. Red Meat radishes are also pretty additions to appetizer plates, cut either in rounds or strips. 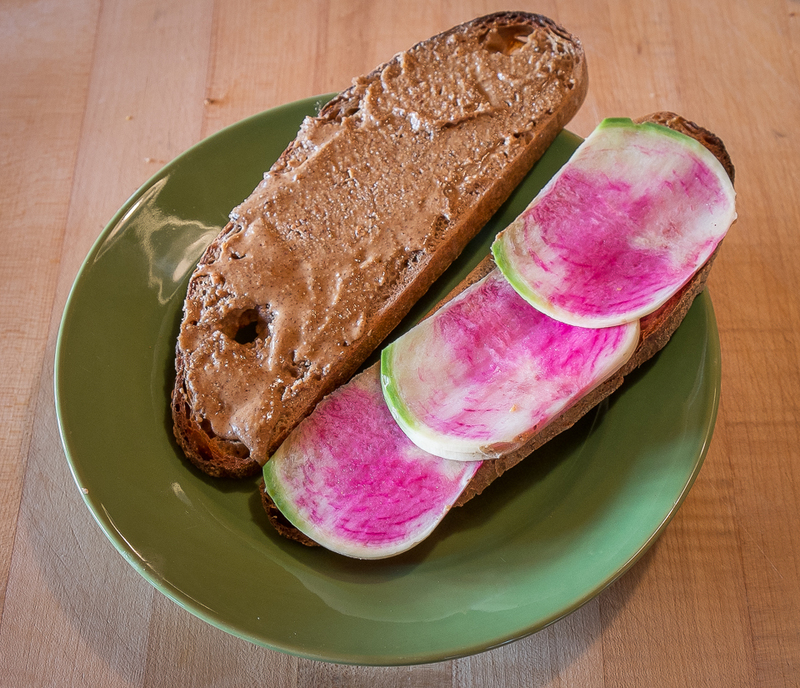 And for lunch, thin slices of these big radishes are delicious with hazelnut butter on whole wheat bread. I have enough seeds of Red Meat for the coming year but to expand my winter radish options I’ve ordered seeds of Green Meat and Round Black Spanish. According to the Fedco catalog descriptions, Green Meat has a “distinct green-apple flavor” and Round Black Spanish has “extremely pungent white flesh.” When I run out of Red Meat seeds, I’ll order Misato Rose, another Fedco offering “also known as Chinese Red Heart radish, described in its native land as xin li mei, meaning ‘in one’s heart beautiful.’” I can imagine a winter radish tasting next year, maybe followed by a mixed radish salad. And more cooking experiments, like pickling. In the meantime, we’ll enjoy the remaining winter radishes. I just wish I’d planted a longer row. 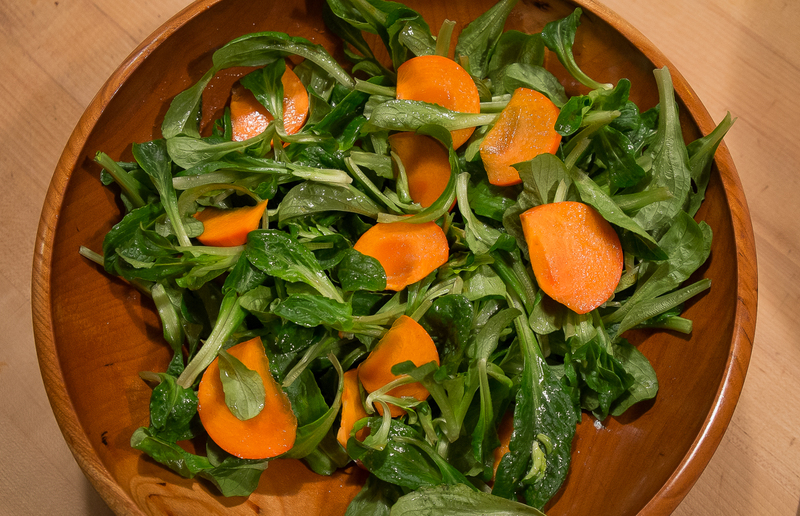 Mâche is the star salad green of this January’s kitchen garden. 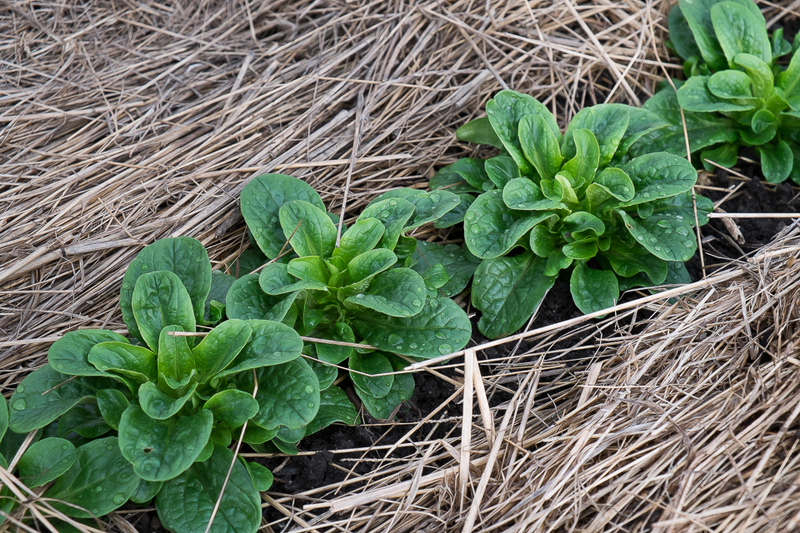 Its dark green rosettes, rising only a few inches above the mulched rows, still look lush and vigorous after the freezing temperatures, snows, rains and winds that have left kale, arugula and mustard looking pretty ragged. These other hardy greens will send out tasty new growth in the weeks ahead, but until they do I’m grateful for mâche and its nutty flavor, succulent texture and rich green color. Alone as a simple salad or tossed with roasted vegetables, raw julienned celery root, apples, nuts or goat cheese, it’s my favorite winter salad green. The botanical name for this lovely green is Valerianella locusta and it goes by many common names besides mâche; corn salad, field salad, lamb’s lettuce are a few. Steve Solomon (Growing Vegetables West of the Cascades, 2007, page 206) explains that the name corn salad comes from mâche’s origin as a foraged wild green that “came up in the stubble of harvested grain fields” in Europe where “small grains like wheat, barley and oats are called corn.” I like this bit of plant history behind the name corn salad but I’m staying with the French name mâche partly because the French were the first to cultivate this green in the 18th century but more to head off any expectation that my salads will contain kernels. Because I like to make succession plantings, I sow mâche each year from mid-August through September, not quite so handy as letting plants self-seed but a good way to establish an extended supply of mâche. My favorite variety is Vit but I also like Verte de Cambrai, another small-leaved variety. I’ve also tried some of the larger leaved varieties like Medallion and Large-Leaf Round but I still prefer the color and flavor of Vit. The seeds germinate best in cool soil so I often start the early sowings in flats in a cool spot and then set out inch-tall seedlings four inches apart in rows twelve inches apart. I sometimes direct seed the last sowings when the weather is cool enough to encourage germination. With either method, I always mulch around the new seedlings to keep rain from splashing dirt up into this low-growing plant. Mâche grows slowly at first but by mid-October there are plenty of greens for salads from the first plantings and the later plantings provide salads until April. Even when the last plants start to bolt in the lengthening days of spring, the greens, stems and even the blossoms remain tasty. When I harvest mâche I cut the entire head, slipping a knife under the rosette and cutting at the root. I could cut the head above the root and encourage a second growth but I find that these new growth leaves are smaller and harder to harvest and clean. Also, it’s easier to carry the whole head to the kitchen and wash it there than to try to get my hands around a pile of loose leaves in the garden. After rinsing each head of mâche, I grasp the rosette root side up in one hand and with the other hand slice across the plant about an inch or so above the root stem. 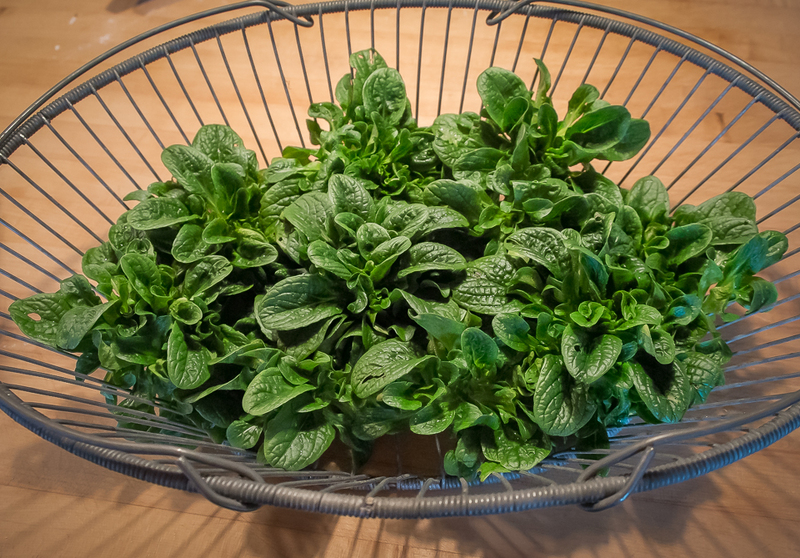 The now separated leaves wash and dry easily in a salad spinner. I use it right away in a salad or pack it loosely in a plastic bag and refrigerate it. One more amazing thing about mâche is that it holds in the fridge for a week or more and still keeps its flavor. 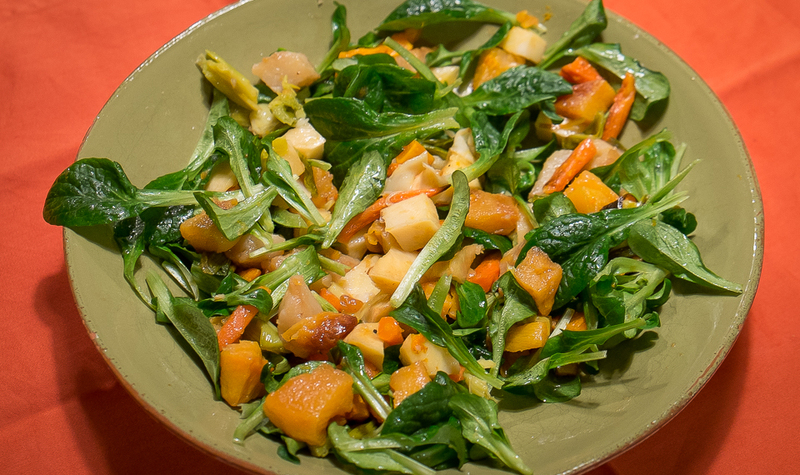 For several nights in a row while hosting holiday guests, we added handfuls of mâche to room temperature chunks of roasted rutabaga, turnip, carrots and parsnips and dressed the mix with sherry vinaigrette for easy and very satisfying salads. 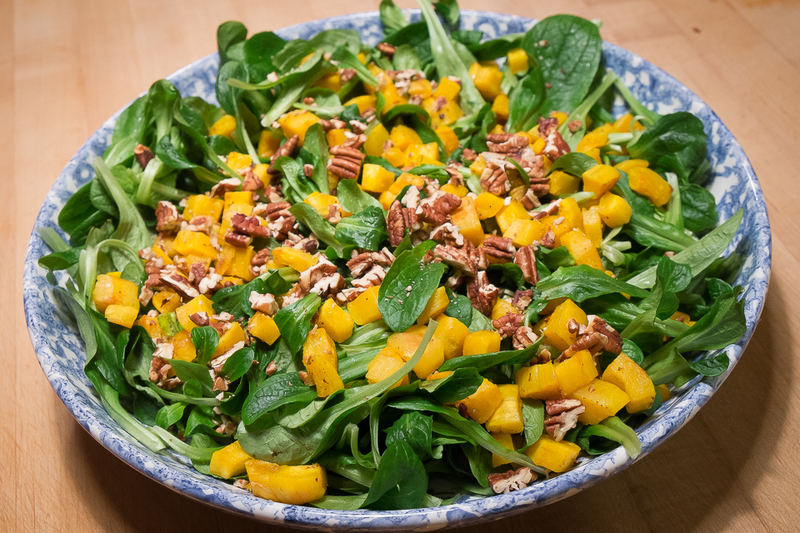 Bits of roasted Delicata squash and pecans are great additions too. For Christmas Eve, I tossed mâche with toasted pecans, crumbled goat cheese and sherry vinaigrette, an elegant and delicious salad. And just the other night I added mâche to another favorite winter salad: celery root, apples and toasted nuts in a white vinegar, mustard and shallot dressing. Parsley would have worked just as well with this salad but mâche was even better. 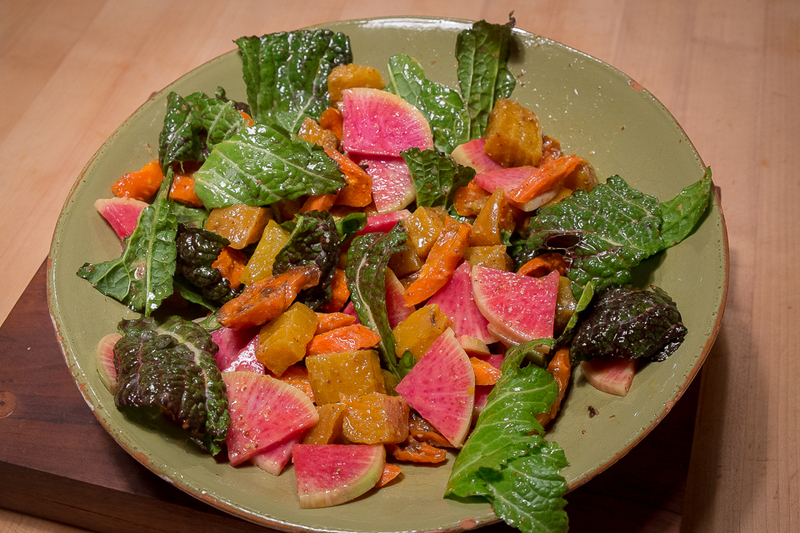 And then there was the lovely persimmon and mâche salad we had a month ago. The pairing possibilities for this tasty green are endless. And luckily there is more mâche growing in the kitchen garden to get us through whatever weather the rest of winter brings us.